Epping Elementary School’s new principal, Justin Benna, has a decidedly personal approach to education. After joining the staff July 1, he took time in August to pay home visits to as many of the school’s students as possible. 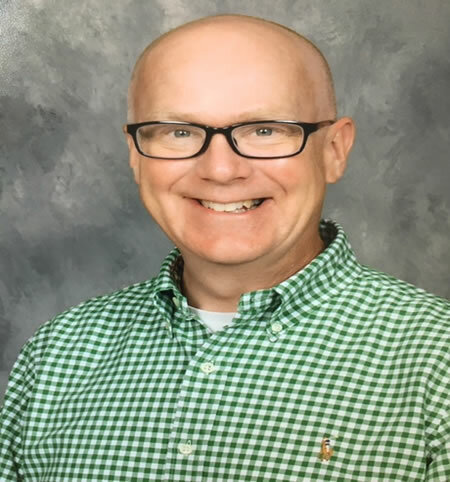 He taught third grade and gifted students in Missouri and Iowa, his native state, as well as serving as Special Projects Coordinator at the College of Education at Iowa State University. He then spent 15 years as an elementary school principal, first at Running Fox Elementary in Missouri and then for 12 years at Enfield Village School in New Hampshire’s Upper Valley. Benna has a Bachelor of Arts degree in Elementary Education from Wartburg College in Waverly, Iowa, and a Master’s degree in Education from Iowa State University. He is nearing completion of his doctorate in Education from the University of New Hampshire. Last year, after 12 years as the Enfield Village principal, he took a year off to devote to his graduate studies and moved to Portsmouth, where he is closer to the university. Benna hopes to receive his Ph.D. in December. That leaves him in an equally good place to devote his time to Epping Elementary. “My first priority this year is to be a learner and to work to identify what my staff’s hopes and dreams are, and find ways to help make them happen,” Benna said. “I’m really excited about Epping. It has been known as a district on the leading edge of moving in the direction the field of education is going. The district is highly invested in performance-based learning and assessments, and folks in town are fiercely proud of their school. Benna said there are just a few new staffers at the approximately 500-student school this year. Those include a special education coordinator, two new classroom teachers, and at least one para-educator, out of a staff of about 100. He is impressed with the low turnover rate. In his spare time, Benna loves to kayak, and is an ardent fan of UNH hockey. And his younger sister and nephew followed him to New Hampshire, where they now live in Campton, giving him family in the state. And those home visits? That’s a practice Benna has followed throughout his career as a principal, although it is new to Epping. He’s met a lot of parents and students during the weekend and evening home visits he made in August, bringing along copies of the lunch menu, school calendar, and a personal letter. “Relationships are key, and I hope this conveys the message that I care about the kids and their families,” he concluded.